The Olympic Torch Relay has been inspiring us here in Canada and it has been interesting watching it travel around the world. The torch will soon be coming through Southern Alberta and shining a light on a rich heritage just waiting to be explored. Alberta racers will capture spectators’ imaginations at the 2010 Winter Olympics in February – Melissa Hollingsworth defying gravity with her skeleton sleigh; Graeme Gorham flying down the ski jump; Alex Gouge on the luge track. But these athletes are not the original Alberta speed racers. That distinction goes to the wild bison – which can stampede at speeds up to 50 km/hr – whose numbers once covered the plains of southern Alberta, an area that eventually earned the treasured UNESCO World Heritage Site designation. As the official Olympic torch relay flows through the southern part of the province, it passes through Head-Smashed-In Buffalo Jump. on January 18, 2010. 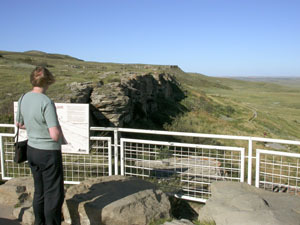 The world’s oldest, largest and best preserved buffalo jump has been used continuously by aboriginal peoples of the plains for nearly 6,000 years, where they depended on the ‘racers’ of their time – bison – to survive. Head-Smashed-In faithfully bears witness to the cultural heritage of the North American Plains Indians. Because of their innate understanding of the local topography and the behaviour of the buffalo, they were able to kill the mammoth animals by corralling them, then chasing them at great speeds over the jump’s rocky precipice to their deaths below, where the animals were "harvested" for every scrap and sinew to sustain the tribes in the winter months ahead. The prominent original peoples in the Head-Smashed-In area were the The Blackfoot, a group of fiercely independent and very successful warriors. The term "Blackfoot" refers to three separate tribes — the Blackfoot proper (Siksika), the Bloods (Kainai), and the Peigan (Pekuni). Each tribe was independent, but they all spoke the same language and regarded themselves as allies. All of the groups depended on the surrounding herds of bison and the jump for food and survival through the long Albertan winters. The Blackfoot’s movements were dictated by the location of the bison herds, the weather and the season. Over 60 million buffalo were estimated to race across the great plains of Southern Alberta and when a drive and jump occurred, the tribes strategically used natural topographic barriers such as coulees, depressions, or hills to funnel buffalo towards the jump. The bison would then careen off the 10 meter cliff into the valley below. After the kill, a ceremony of celebration was often held and the tribes got to work ito strip and preserve the bison carcasses. Nothing went to waste. Meat was made into pemmican through sun drying, pulverizing and flavoring with local berries such as chokecherries adn saskatoons. Horns were scraped out and formed into eating utensils and spoons. Tongues were offered to the tribe’s medicine men or women and skins were taken for use as lodge covers and other shelter devices. 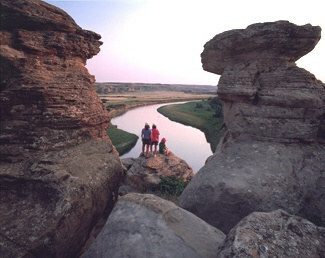 Today, Head-Smashed-In Buffalo Jump is a testament to preservation and respect for its surroundings and environment. Its $10 million Interpretive Centre blends unobtrusively into the ancient sandstone cliff and is open year-round for visitors from around the world. 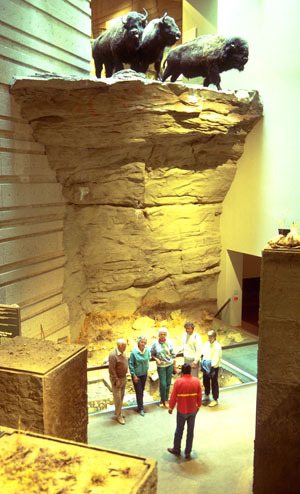 Inside, the Centre consists of five distinct levels depicting the ecology, mythology, lifestyle and technology of Blackfoot peoples within the context of available archaeological evidence. Interpretation of these themes presents the viewpoints of both aboriginal peoples and European archaeological science. Educational opportunities of all kinds are available for visitors to the Centre and include guided tours and classes for all ages. In the springtime, a special “Sundays at the Jump” series features hands-on activities designed to showcase the Blackfoot culture including beading, the creation of hand drums, hiking into the drive lanes, and instruction regarding ancient tools and weapons. For a day each year in late June National Aboriginal Day is celebrated at the jump with world-famous interpretive dancers attending and recognition of the First Nations’ contributions to Canadian society. During the holiday season, Head-Smashed-In also holds a special Christmas festival called Heritage Through My Hands, which brings together First Nations artists and craftspeople who display a wide variety of jewelry, clothing, art and crafts for sale as seasonal gifts. For the visitor to Head-Smashed-In who seeks a fuller, intensive experience in exploration, opportunities to participate in actual archeological digs on site with Albertan archeologists are available at designated times throughout the warmer months. Tipi camping during the summer also allows visitors to experience Head-Smashed-In just as the Blackfoot did. Guests can camp in an authentic Blackfoot tipis beneath the cliffs of the jump, hike the trails and cook and sample the food and meals the early tribes ate. If you are interested in finding out more about the Olympic Torch Relay go to the official 2010 Olympic Website under Olympic Torch Relay or just click here!